Marketing, design, and technical resources for making your digital and print communications more effective. Why would hackers care enough to attack your website? As you may already be aware, all Facebook Pages will automatically change over to the new Page format on March 30, 2012 (you can change yours over sooner if you wish). This will be a completely new design with the "wall" being replaced with the newer "timeline" layout that Facebook has already introduced to personal profile pages. Q: Will my current page branding stay intact after the transition? If you currently have a left column graphic with branding that will be gone as will the top thumbnail images that are sometimes used for branding. The thumbnail size image you see next to each of your posts will be used as new "profile picture" (the red and two-tone blue logo icon in the sample page design). Q: What elements can be branded in the new Page design? 1. The updated square "profile picture" (which still serves as the same image used for your thumbnail image). I recommend uploading as high of resolution as possible 250px x 250px (or larger square) PNG 24 image. Unfortunately, Facebook still down samples any images you upload which degrades the quality. 2. Some of the new navigation thumbnail images located at the bottom of the top page section. 3. A new large "Cover Photo" which appears at the top of your page. The dimensions for this new image are 851px x 315px. Like the profile picture Facebook will down-sample this image and degrade the quality when you upload it. While it’s great we have so much more space to work with for branding, Facebook has placed quite a few branding restrictions on this new image space. This space is not meant for promotions, coupons, or advertisements. Your cover photo should not be primarily text-based. iv. calls to action, such as "Get it now" or "Tell your friends." Q: What are some examples of companies that have implemented branded profile pictures within Facebook’s new guidelines? Q: Where are the links to my other pages / features that used to be on the left? The first four are now arranged horizontally right below your cover photo and profile picture; the remaining are accessible by clicking the drop arrow marked with the green arrow in the screenshot below. Q: Do my custom developed Facebook features still work and if so where can I find them? Yes, they will be listed as either the fourth item in the new navigation or within the drop down menu. See the red arrow in the screen shot above, or go to the sample New Facebook Page design and click on the star icon in the menu. 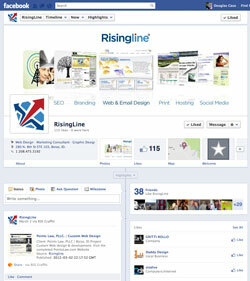 Q: Where can I get more information on the new Facebook Page design? Q: Where can I complain if I don’t like the new design? "We hate the new profile page…please change it back" Facebook page. Q: What do you think of the new layout? Honestly, I like the new design a lot and I like the restrictions that Facebook has placed on the cover photo image. Forcing Facebook designers to work with fewer options will result in cleaner, higher quality and more creative designs. Less clutter is always a good thing. The last thing I want to see as a user is a bigger space graphic space that will just get filled with a bunch of oversized "like me" arrow graphics and other cheesy design elements. While the timeline feature is still in its infancy, I like the direction Facebook is headed with this and I believe it presents a superior and cleaner presentation of information. Loosing the old (or current I should say) 3 columns of clutter and ads is definitely a good thing. The biggest initial "con" I have to the new page layout is the placement of the page navigation icons. I don’t like having to click the drop down menu to see all of them. We’re available to assist you with Facebook branding and development. Contact us online or by phone at 208.475.3192. For samples of our past design work check out our portfolio page.